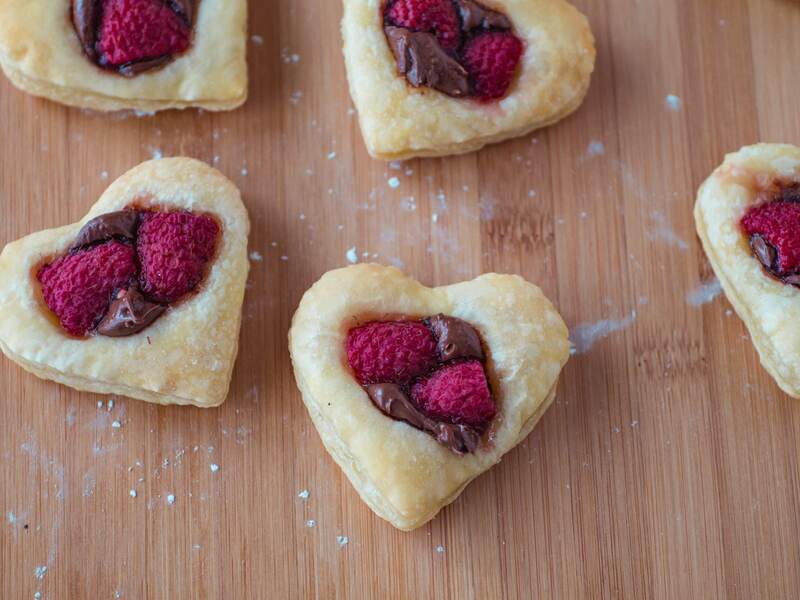 These Valentine Puff Pastry Cookies are super easy to make, and perfect for Valentine’s Day! 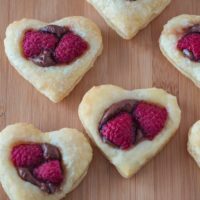 Puff pastry is cut into hearts and topped with creamy Nutella and raspberries then baked until golden brown for a sweet and flaky cookie that is ready in minutes. These puff pastry cookies are almost embarrassingly easy to make. But sometimes you don’t want a complicated multi-step dessert – you just want a quick and easy sweet treat for your family. 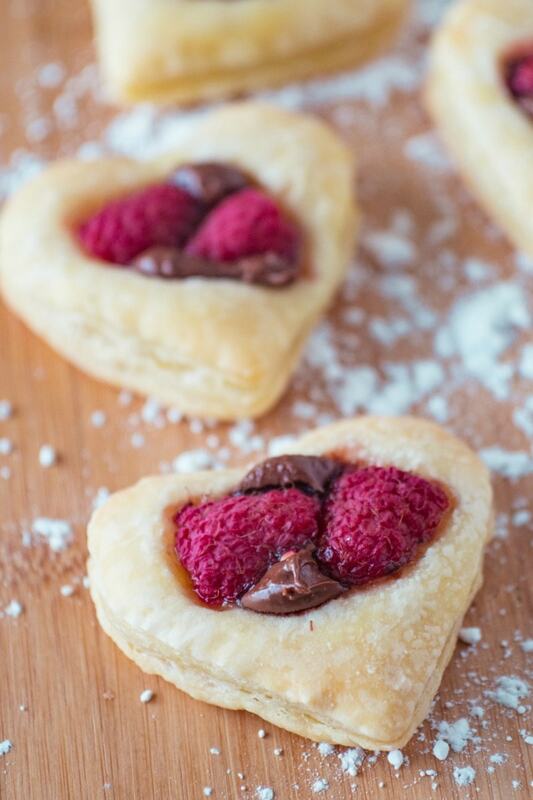 This is a super easy dessert you can make in a hurry with only THREE ingredients – puff pastry, Nutella and fresh raspberries. The key to making this recipe so easy is that it uses puff pastry as cookie dough. This means there is no mixing batter and measuring flour and sugar, you just need to get puff pastry dough out of the freezer to thaw. The easiest way to thaw the puff pastry dough is to move it from the freezer to the refrigerator the night before you plan to use it and let it thaw overnight. Once the puff pastry is thawed, unfold the pastry sheet and place it on a lightly floured surface. 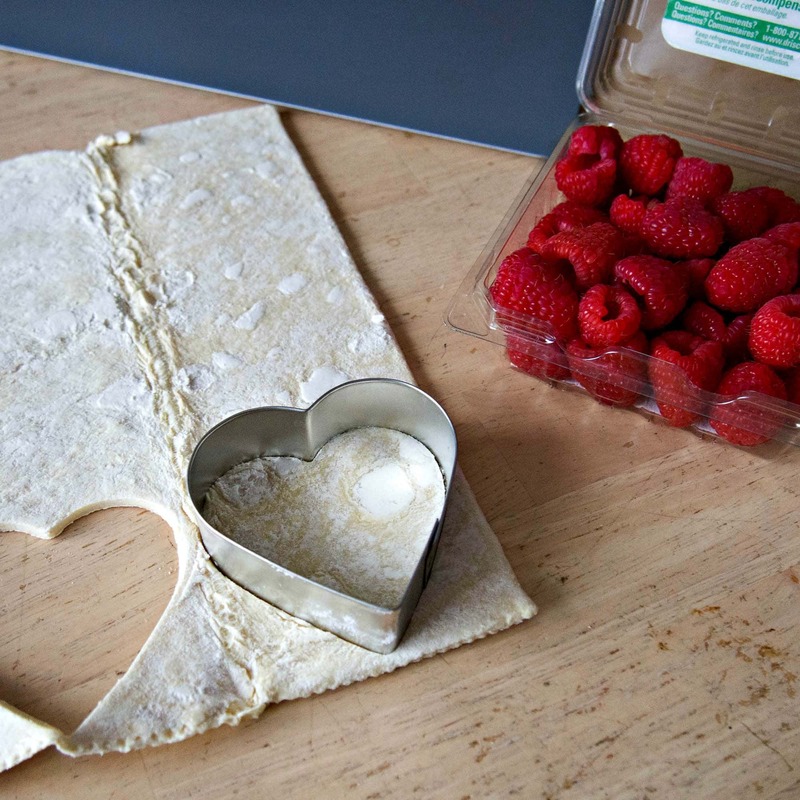 Then use a heart shaped cookie cutter to cut Valentine shapes into the sheet of dough. Cut the cookies close together so there isn’t much waste, because the dough doesn’t really re-roll. Use a knife to carefully move the hearts to a cookie sheet. Put a 1/2 teaspoon of Nutella on each heart shape. Cut a raspberry in half and press each half into the Nutella. 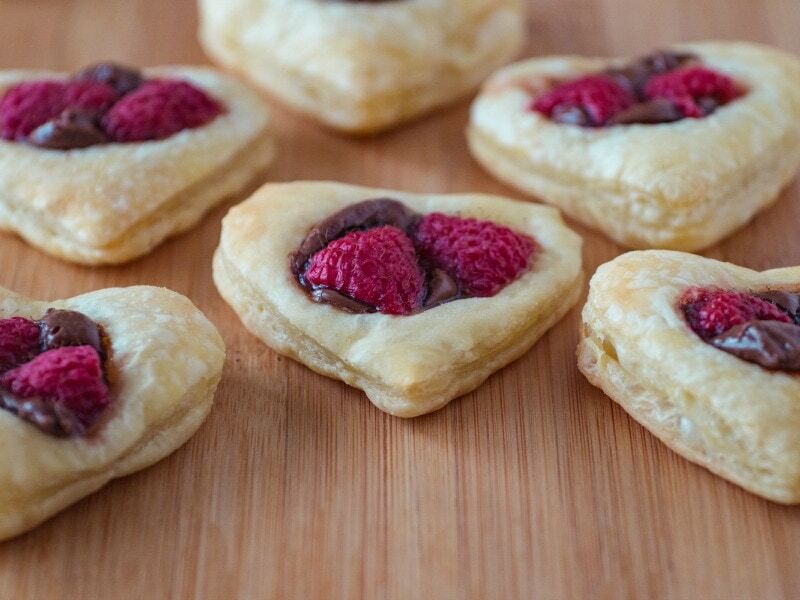 I experimented with using whole raspberries but I felt the two halves looked better on the puff pastry cookies. That is all there is to it, the cookies get baked for 15 minutes until the pastry is crisp and brown. It doesn’t get much easier than that when it comes to baking! The cookies are flaky and delicious, and perfect for an easy Valentine’s Day treat. While thawing the box of puff pastry overnight in the refrigerator is easiest, it does require some planning. But what if there is baking emergency – like your son “forgot” to tell you he needs 2 dozen cookies for Cub Scouts? Well luckily you can quickly thaw the puff pastry at room temperature. 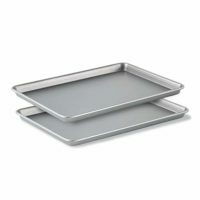 Simply take the sheets you plan to use out of the box and put them on the counter top to thaw. Check it after 20 minutes and see if it has unthawed enough to unroll and handle. The only potential downside to this approach is that you can let the puff pastry sit at room temperature too long. Puff pastry works best when it is cold. If the puff pastry gets too warm it gets soft and sticky. If that happens you need to return it the refrigerator to firm up. Puff pastry that is too soft won’t rise, which means you won’t get the flaky layers that make it so tasty. Generally 20-40 minutes at room temperature is enough to thaw the dough. Puff pastry is a dough which is made by mixing a dough and then folding a layers of butter in between layers of dough. The dough is repeatedly rolled and folded again, making many, many layers of dough. 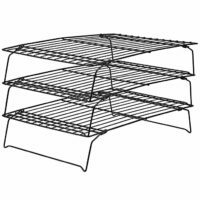 It is a relatively simple concept, but you need to repeat the folding and rolling over and over. In addition the folding has to be done in a particular pattern. So while making your own puff pastry doesn’t take a lot of ingredients it does take practice and time. That is why puff pastry dough is such a good ingredient to keep in your freezer. 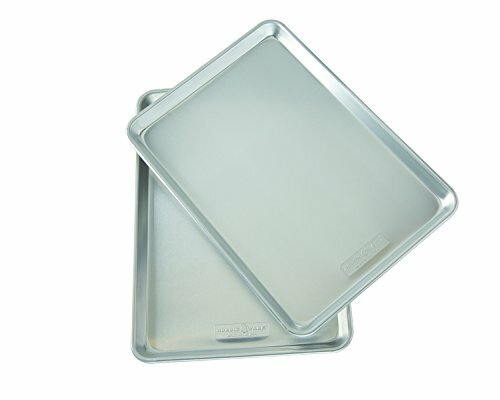 You can use it to easily create a wide variety dishes, from sweet ones like tarts or these cookies to savory dishes like Beef Wellington or appetizer cups. There aren’t many things that beat puffed pastry for creating an elegant dessert or dinner without much advance notice. 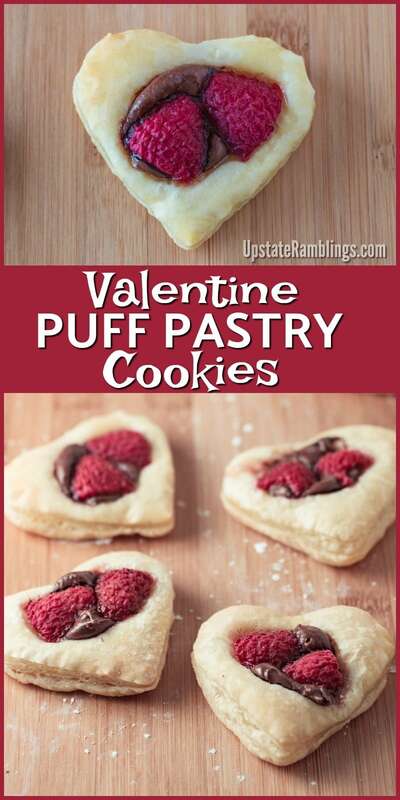 So if you need to make a quick and easy treat for your sweetheart or family this Valentine’s Day try these Puff Pastry Cookies. With only three simple ingredients they are perfect for making a super easy dessert on a busy day. 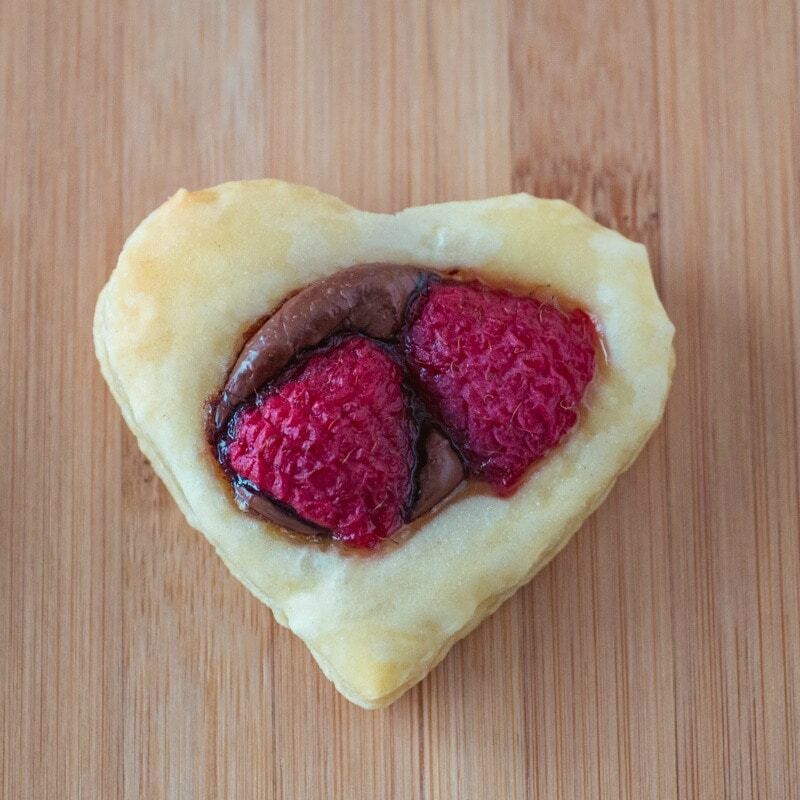 Puff pastry is cut into hearts and topped with creamy Nutella and raspberries for a Valentine's Day cookie. Defrost the puff pastry dough by putting it in the refrigerator overnight. Or leave it on the counter at room temperature for 20-40 minutes. Unroll the puff pastry and place on a floured surface. 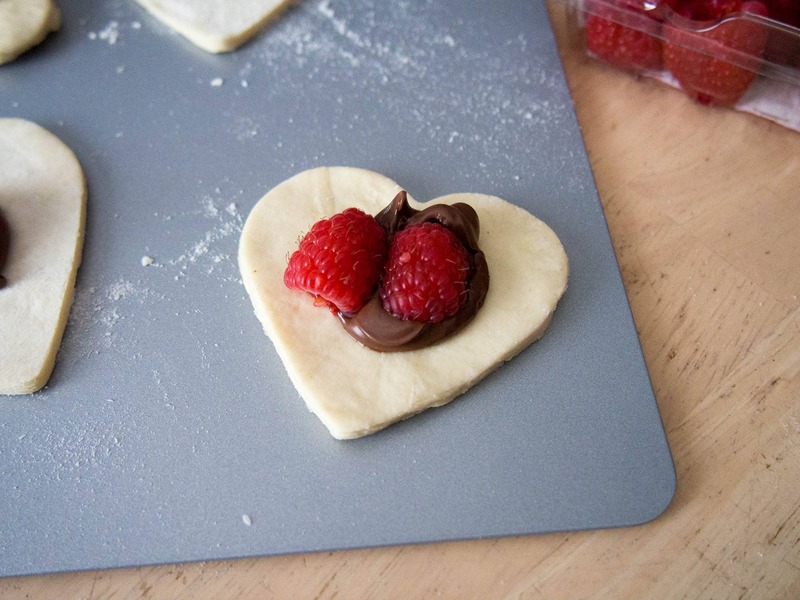 Use a heart shaped cookie cutter to cut the dough. Use a knife to carefully move the hearts to an ungreased cookie sheet. Add 1/2 t. of Nutella to the center of each cookie. Cut a raspberry in half and press each half into the Nutella. Bake for 15 minutes until crisp. Look for puff pastry made with butter. If it is made with shortening or some other oil it just won’t be as tasty. You could substitute blackberries or blueberries for the raspberries. Strawberries would taste good, but they are too large for these puff pastry cookies. Brilliant! And puff pastry – YUM! Nutella is a bonus too. Really lovely! Anything raspberry and I’m so there. Puff pastry. Nutella . Rasberries. How could you go wrong. Looks yum ! 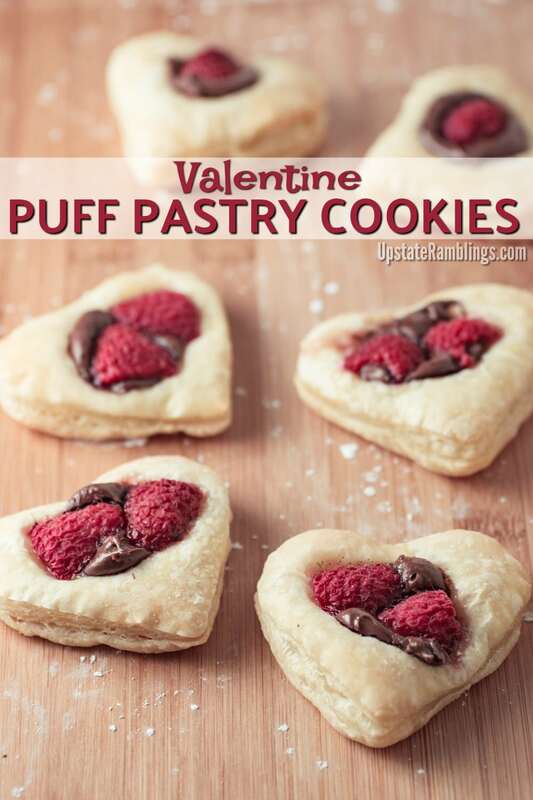 Puff pastry is so easy to work with, love this idea for a Valentine’s Day cookie! Wow! That is so easy and looks so fancy!! What a great idea!! What a great use of puff pastry! These little beauties look fresh from a bakery! Oh man HOW have I not thought of this combination? Raspberries and nutella sound amazing! So clever! I bet these were devoured! How ingenious and creative! They look beautiful and, I’m with you, nothing goes better together than chocolate and raspberries. This is one to put on my recipe radar for a quick dessert if unexpected company shows. Yum! These really are a unique cookie. I bet my daughter would love to make these for her friends at school. I love the chocolate and Nutella idea, but the flavor combination you could try are endless. This recipe looks delicious, love the simplicity of the cookie! Awesome idea for Valentines! Thank you for sharing this with us at #SaucySaturdays! Such a cute idea for Valentines day. I would love to see these linked up at FAMILY JOY BLOG LINK UP PARTY!! Starts tonight @ 5pm MST. Awesome! I love Nutella! Pinned! Visiting via What’d You Do This Weekend Blog Hop! These are beautiful. And raspberries + Netella…there’s no better combo. Thanks for sharing! This looks so easy I am gong to try them with my granddaughter! Pinned and shared. Thanks for linking up at #overthemoon! I hope to see you also at #thursdayfavoritethings. My daughter will love me forever for these! 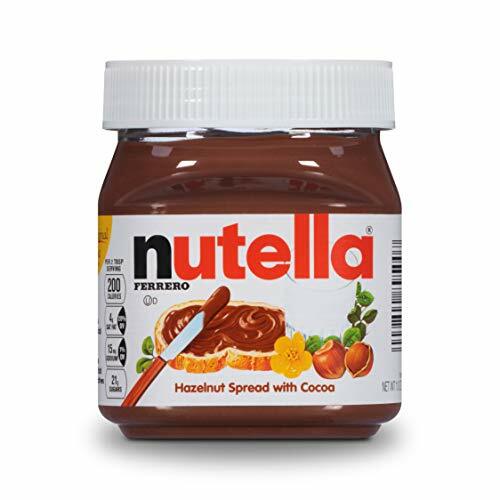 I know Nutella has A LOT of fans but she still might be its biggest! Thanks for sharing these at Saucy Saturdays. Sometimes the simplest ingredients make the best things! This looks like something I will have to treat myself to this Valentine’s Day. Love it! I may have drooled just looking at that first picture! This pastry looks absolutely delicious. Perhaps I can find the time to make it for my class if I don’t break the bank with their VD gifts lol Thank you for the recipe! 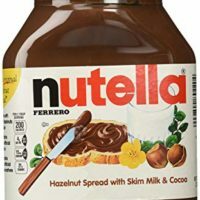 I love 3 ingredient recipes, especially with Nutella! Thanks so much for linking up at Oh My Heartise Girls Wordless Wednesday! Looks oh so yummy and easy to make, my kind of dessert. These sounds amazing! Thank you for liking up to this week’s Tasty Tuesday linky! I have pinned your recipe to the Creative K Tasty Tusday Pinterest board. I hope that you come back again on Tuesday. Yummy, these look so good. I’ve actually already pinned this once and now I see it again and still love it! Thanks for sharing some of your favorite things for the Thursday Favorite Things Blog Hop! I have pinned this to the Thursday Favorite Things Pinterest Board. These look so yummy and they’re really cute! Thanks for sharing at My Flagstaff Home. I just love your cookies! Thank you so much for sharing with us for our 5th Anniversary of Full Plate Thursday! Hope you have a fantastic week and hope to see you again real soon! These look so pretty. I love how easy they are to make and the 3 yummy ingredients. Thanks so much for sharing.